UNIRAK STORAGE SYSTEMS From concept drawings to timely shipment & professional installation, Unirak provides 100% Customer Satisfaction. Quality pallet and dynamic racking structures are the backbone of the modern warehouse. Trust decades of experience, state-of-the-art roll-forming mills, robotic welding cells and hi-gloss powder coating to complement your operation. The Toughest Carts on the Planet. Finally, 30 tons of load capacity with real flare. Introducing custom trucks from Hamilton. They thrive under unconventional pressure. From oversized trucks that haul submarine propellers and airplane wings, to smaller rigs for toting race car engines. Red-hot trim optional. See our custom trucks at CartsAndTrailers.com. ÂŠ 2013 Hamilton Caster & MFG. Co.
ÂŠ 2017 Hamilton Caster & MFG. Co. Celebrating over a decade as the global leader in New, Used and ReConditioned Industrial Battery Technology and Accessories. ReConditioning Process ReCon Batteries are the solution for applications requiring 6 hours of daily usage. Small and Medium sized Business operations, Large warehouse back-up batteries, rental units, and used truck sales. Each ReCon battery has undergone the 18-stage Reconditioning Process and has a minimum rated capacity of 85%. All batteries are hand sanded, cleaned, painted and equipped with brand new parts (vent caps, shrouds and cables). 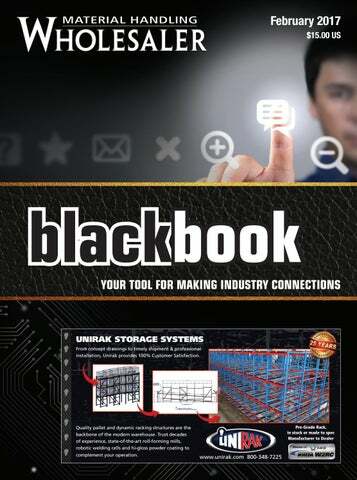 Material Handling Wholesaler Black Book is published twice per year for new and used equipment dealers, equipment manufacturers, manufacturer’s reps, parts suppliers, and service facilities serving the material handling industry. Advertorial expressed here in this publication come from the author’s and do not necessarily reflect the opinions of Material Handling Wholesaler. ADVERTISING CALL 877-638-6190 Email: dmillius@MHWmag.com • acoffman@MHWmag.com Material Handling Wholesaler reserves the right to reject or cancel any advertising for any reason, at any time. Advertisements that simulate Material Handling Wholesaler editorial matter in appearance or style or that are not immediately identifiable as advertisements are not acceptable. COPIES OF BLACK BOOK: $15.00 ea. 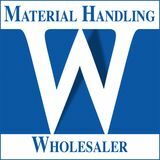 Material Handling Wholesaler, P. O. Box 725 Dubuque, IA 52004-0725 Toll-free: 877-638-6190 or 563-557-4495 Fax: 563-557-4499 © Copyright Speciality Publications International, Inc.
Cantilever Racks • Structural Pallet Racks Portable Stacking Racks • Specialty Transport & Storage Products West Point Rack is one of the fastest growing companies in the industry. Our customers recognize quality products, dependability of service and competitive pricing. Our Primary Goal is to support our dealers, satisfy their customers, earn trust and be the “Vendor of Choice” for rack products and racking systems. We offer a full line of light duty, intermediate duty, heavy and extra heavy duty cantilever racks. We provide multiple configurations of a wide variety of stacking racks. Our structural pallet racks can be configured for a wide range of applications. West Point Rack has the products that generates solutions for your storage needs. We also offer specialty products such as bar cradle trucks, drum racks, hand carts and other specialty transport and storage products. Give us a call at 866.245.3630. We may have what you need. Look forward to hearing from you. Scottsdale, AZ Phone: 602-218-8556 Email: info@findadistributor.com Follow US on Twitter: @FADnetwork Are you a distributor, dealer or OEM selling info@ﬁndadistrubutor.com material handling, supply chain and logistics equipment, products and services in North America? findadistributor.com connects you with local end users that are trying to source and purchase the right products and services related to the lifting, movement and storage of materials. Meijer Handling Solutions 131 Franklin Plaza, Unit #335 Franklin, NC 28734 Phone: 828-349-9619 Fax: 877-548-4604 Web Site: www.telescopicforks.com Email:info@meijer-group.com Meijer Handling Solutions has long been known as the pioneer and world market leader of the innovative hydraulic and manual telescopic forks more commonly known as KOOI-REACHFORKS®. Meijer Handling Solutions also offers a complete range of pallet-less handling attachments, (www.slipsheet-attachments.com), which includes ROLLERFORKS®, Rollerized Tine Extenders, Push-Pull attachments, Stationary Pallet Changers, (load transfer stations), and more. Other innovative equipment includes Mast Height Extension Systems, (Vertical Lift Forks), hydraulic telescopic Jib Cranes, Booms, Rollerized Tine Extenders for air cargo and more. Aerial Work Platform Parts TVH TVH Headquarters 16355 South Lone Elm Road Olathe, KS 66062 USA Phone: 913-829-1000 Toll-Free: 800-255-4109 Fax: 913-829-9208 Email: US.Sales@tvh.com Website: www.tvh.com TVH is the worldwide leading supplier of quality replacement parts and accessories for all your material handling and industrial equipment needs! With over 8 million parts and 11 distribution centers in North America, you’ll be able to find the right part in stock and know that it’s ready to ship. Our commitment to service, knowledge and product availability has made us a One-Stop-Shop for our customers and their business needs. TVH is the worldwide leading supplier of quality replacement parts and accessories for all your material handling and industrial equipment needs! With over 8 million parts and 11 distribution centers in North America, you’ll be able to find the right part in stock and know that it’s ready to ship. Our commitment to service, knowledge and product availability has made us a One-Stop-Shop for our customers and their business needs. Auction Companies Bill Troop, General Manager Hess Auctioneers, LLC. 1451 River Rd. Marietta, PA 17547 Phone: 866-511-2493 Fax: 717-427-1665 Email: sales@hessauctioneers.com Web Site: www.hessauctioneers.com Member Affiliations: PMTA, ABC, UTA Material Handling/Ag/Construction Equipment, Truck & Trailer Consignment Auctions held every 8-10 weeks in Marietta, PA. Also Fleet/ Business Liquidations and Dispersals held on-site. Online Bidding Available! Call us today to get details on consigning your Material Handling Equipment or for information on upcoming auctions. 2017 Auction Dates: February 17, April 21, June 16, August 18, October 20 and December 8. 1015 Harrisburg Pike Carlisle, PA 17013 Toll-Free: 800-333-1194 Fax: 800-333-9194 Email: sales@fsip.biz Web Site: www.fsip.biz Member Affiliations: MHI, MHEDA FSIP remanufactures electronic controllers, chargers, joysticks & dash displays used on forklifts, pallet jacks, aerial lifts and many other vehicles. They are the exclusive manufacturer of GE Electric Vehicle Controls and Parts, distributor of new Curtis controls, new SPE Elettronica chargers, and new Delta-Q chargers. FSIP also offers many choices in test equipment, along with the Xtender Battery Regenerator, for desulfating and restoring lead-acid batteries. TVH TVH Headquarters 16355 South Lone Elm Road Olathe, KS 66062 USA Phone: 913-829-1000 Toll-Free: 800-255-4109 Fax: 913-829-9208 Email: US.Sales@tvh.com Website: www.tvh.com TVH is the worldwide leading supplier of quality replacement parts and accessories for all your material handling and industrial equipment needs! With over 8 million parts and 11 distribution centers in North America, you’ll be able to find the right part in stock and know that it’s ready to ship. Our commitment to service, knowledge and product availability has made us a One-Stop-Shop for our customers and their business needs. Quantum Storage is the fastest growing bin supplier in the country! Choose Quantum Storage Systems for the largest selection of Industrial plastic bins and Warehouse bin storage systems. From rugged and strong stackable storage bins to tough durable nesting shelf bins for the industrial, material handling and consumer markets. Cantilever Racks: New West Point Rack, Inc.
XtraPower Batteries 132 St. Joseph Boulevard Lachine, Quebec, Canada H8S 2L3 Phone: 877-422-9797 or 514-422-9797 Fax: 215-243-2941 Email: info@xpb.ca Web Site: www.xtrapowerbatteries.com XtraPower Batteries is an industrial forklift battery company that produces reconditioned batteries using patented regen technologies. By recycling batteries, XtraPower gives its customers the environmentally friendly and economically sound choice for reliable motive power solutions. Hamilton Caster Carts & Trailers The Toughest Carts on the Planet. 1637 Dixie Highway Hamilton, OH 45011 Phone: 800-733-7655 Fax: 513-863-5508 Web Site: www.HamiltonCaster.com & www.CartsandTrailers.com Member Affiliations: MHI, MHEDA, EASE Founded in 1907, Hamilton Caster is an industry leader in designing and manufacturing heavy-duty industrial casters, wheels, carts, and trailers. Hamilton specializes in the custom design and manufacturing of large capacity casters ranging from 1,000 lbs. up to 40,000 lbs. and industrial trailers ranging from 2,000 lbs. up to 100,000 lbs. Material Handling Huddle One-Day Conference Midwest 801 Bluff St. Dubuque, IA 52001 877 638-6190 Email: info@MHhuddle.com Website: www.MHhuddle.com The Material Handling Huddle is an opportunity for you to build more profitable businesses through networking and education. Increase your knowledge of issues, regulations, products and services vital to our industry. Develop and improve relationships with other dealers and manufacturers. Join us at the Holiday Inn-Rolling Meadows, Ill. for an educational one-day conference, June 7, with key industry leaders giving you ideas to take back to your business tomorrow. This four-session format will include topics that are trending in the industry. Take part in networking opportunities before and during the event, plus a vendor mall for ideas on products and services to expand your product line. Nutting/Acco Material Handling Solutions has been an industry leader for 126 years. We offer platform trucks, order picking platforms, carts, trailers, custom designed material handling equipment, hand trucks, casters and wheels, as well as monorail cranes & hoists, grabs, lifters and track. Casters Jim Lippert Hamilton Caster Carts & Trailers The Toughest Carts on the Planet. 1637 Dixie Highway Hamilton, OH 45011 Phone: 800-733-7655 Fax: 513-863-5508 Web Site: www.HamiltonCaster.com & www.CartsandTrailers.com Member Affiliations: MHI, MHEDA, EASE Founded in 1907, Hamilton Caster is an industry leader in designing and manufacturing heavy-duty industrial casters, wheels, carts, and trailers. Hamilton specializes in the custom design and manufacturing of large capacity casters ranging from 1,000 lbs. up to 40,000 lbs. and industrial trailers ranging from 2,000 lbs. up to 100,000 lbs. The Material Handling Huddle is an opportunity for you to build more profitable businesses through networking and education. Increase your knowledge of issues, regulations, products and services vital to our industry. Develop and improve relationships with other dealers and manufacturers. Join us at the Holiday Inn-Rolling Meadows, Ill. for an educational one-day conference, June 7, with key industry leaders giving you ideas to take back to your business tomorrow. This four-session format will include topics that are trending in the industry. Take part in networking opportunities before and during the event, plus a vendor mall for ideas on products and services to expand your product line. Dave Baiocchi Resonant Dealer Services 4229 Volpaia Place Manteca, CA 95337 209 652-7511 www.resonantdealer.com dave@resonantdealer.com RDS assists dealers in development of best practices. Pre-engineered programs are customized and branded to assist dealers in improving processes in equipment sales, aftermarket offerings, management compensation, incentive programs, and inventory control. These programs are designed to both enhance profitability, and make dealers “employers of choice” in their marketplace. FSIP remanufactures electronic controllers, chargers, joysticks & dash displays used on forklifts, pallet jacks, aerial lifts and many other vehicles. They are the exclusive manufacturer of GE Electric Vehicle Controls and Parts, distributor of new Curtis controls, new SPE Elettronica chargers, and new Delta-Q chargers. FSIP also offers many choices in test equipment, along with the Xtender Battery Regenerator, for desulfating and restoring lead-acid batteries. Flight Systems Industrial Products (FSIP) 1015 Harrisburg Pike Carlisle, PA 17013 Toll-Free: 800-333-1194 Fax: 800-333-9194 Email: sales@fsip.biz Web Site: www.fsip.biz Member Affiliations: MHI, MHEDA FSIP remanufactures electronic controllers, chargers, joysticks & dash displays used on forklifts, pallet jacks, aerial lifts and many other vehicles. They are the exclusive manufacturer of GE Electric Vehicle Controls and Parts, distributor of new Curtis controls, new SPE Elettronica chargers, and new Delta-Q chargers. FSIP also offers many choices in test equipment, along with the Xtender Battery Regenerator, for desulfating and restoring lead-acid batteries. Are you a distributor, dealer or OEM selling material handling, supply chain and logistics equipment, products and services in North America?Â findadistributor.com connects you with local end users that are trying to source and purchase the right products and services related to the lifting, movement and storage of materials. Drive Axles: Remanufactured American Industrial Transmission Phone: 800-588-7515 Web Site: www.aittransmission.com American Industrial Transmission is proud to announce that in addition to our reman transmissions, we offer Reman Drive Axles. Our techs use a number of the skills used in transmission rebuilding when they rebuild a drive axle. Some styles are on the shelf, ready to ship. Others must be done as a rebuild and return. Our pricing is competitive. Our quality is the first-rate. We offer a 6-month or 1500 hour warranty. Call us for a quote. 800-588-7515. Your source for new vendors! Reduce safety risks & workers comp claims! Thin profile allows easy entry on 4-way GMA type pallets! Always there when you need them! Manual Extension Forks provide a simple solution for handling differing load sizes or dual load transport. They replace the original forklift tines so they are always there when you need them. A simple fingertip locking mechanism, which doubles as a grease point, allows the forks to be extended manually and locked into an extended position for safe and secure transport of goods. They’re ideal for applications which have infrequent need for handling differing loads sizes. For more demanding applications, we recommend our original hydraulic telescopic KOOI-REACH FORKS® which allow length adjustment at the touch of a lever. Phone: 800-588-7515 Web Site: www.aittransmission.com In addition to remanufacturing automatic transmissions and oil clutch transmissions, AIT offers reman master drive units for electric lift trucks. We have excellent coverage on Hyster and Yale MDU’s, good coverage on Toyota and Cat, and are working on increasing our Clark offerings. Our reman drive units carry the same 6-month, 1500 hour warranty that our reman transmissions carry. Education Material Handling Huddle One-Day Conference Midwest Material Handling Huddle One-Day Conference Midwest 801 Bluff St. Dubuque, IA 52001 877 638-6190 Email: info@MHhuddle.com Website: www.MHhuddle.com The Material Handling Huddle is an opportunity for you to build more profitable businesses through networking and education. Increase your knowledge of issues, regulations, products and services vital to our industry. Develop and improve relationships with other dealers and manufacturers. Join us at the Holiday Inn-Rolling Meadows, Ill. for an educational one-day conference, June 7, with key industry leaders giving you ideas to take back to your business tomorrow. This four-session format will include topics that are trending in the industry. Take part in networking opportunities before and during the event, plus a vendor mall for ideas on products and services to expand your product line. Engines: New TVH TVH Headquarters 16355 South Lone Elm Road Olathe, KS 66062 USA Phone: 913-829-1000 Toll-Free: 800-255-4109 Fax: 913-829-9208 Email: US.Sales@tvh.com Website: www.tvh.com TVH is the worldwide leading supplier of quality replacement parts and accessories for all your material handling and industrial equipment needs! With over 8 million parts and 11 distribution centers in North America, you’ll be able to find the right part in stock and know that it’s ready to ship. Our commitment to service, knowledge and product availability has made us a One-Stop-Shop for our customers and their business needs. Forklift Accessories Terry Wickman Keytroller, LLC 3907 W. Martin Luther King Blvd. Tampa, FL 33614 Phone: 813-877-4500 Fax: 813-671-6250 Email: info@keytroller.com Web Site: www.keytroller.com Member Affiliations: MHEDA, MHI Manufacturer of forklift safety devices: access monitoring, speed and abuse control, checklist automation, wireless hour meters, high accuracy weighing systems. Worldwide LiftTrucks Trucks WorldwideWholesaler Wholesalerof of Quality Quality Lift 9801 Drive •• Pineville, 9801 Industrial Industrial Drive Pineville,NC NC 28134 28134 ••980.272.0507 980.272.0507 ¡Se¡Se Habla Español! Habla Español! VIEW THE FULL INVENTORY AVAILABLE ONLINE! Are you a distributor, dealer or OEM selling material handling, supply chain and logistics equipment, products and services in North America? findadistributor.com connects you with local end users that are trying to source and purchase the right products and services related to the lifting, movement and storage of materials. Henry Richardson Southland Equipment Service, Inc. 109 N Shorecrest Rd. Columbia, SC 29209 Phone: 803-783-1171 Fax: 803-783-2557 Email: Sales@SouthlandSC.com Web Site: www.SouthlandSC.com Member Affiliations: NFIB; S.C. Chamber of Commerce; Committee of 100, Central SC Alliance Established in 1971 – Service and Parts for ALL brands, New, Used, Rental, Leasing - related material handling equipment. Expert Nationwide Parts Service. Forklift Professionals. Forklifts: Exports Bill Zemack FORKLIFT PRO, Inc. 9801 Industrial Drive PO Box 99 Pineville, NC 28134 Phone: 704-716- 3636 Fax: 704-714- 4622 Email: bill@theforkliftpro.com Large selection of quality used equipment ~ Cushions / Pneumatics LP / Gas / Diesel / Electrics. Rough Terrains to Narrow Aisle. Call us first. Export Specialists! Always stocking ~ New Side Shifters/Forks/Carpet Poles/ Chargers Call Bill - THE FORKLIFT PRO! The WORLDWIDE Wholesaler of Quality Lift Trucks! Ivana Fiamoncini Ivana Fiamoncini LiuGong Forklift Americas. 22220 Merchants Way, Suite 100 Katy, Texas 77449 Phone: 281-579-8882 Fax: 281-579-8388 Email: Ifiamoncini@liugongna.com Website: www.liugongna.com LiuGong North America, located in Katy, Texas, provides world class construction and material handling equipment and supports their dealers with sales, service, parts, warranty, marketing and financial support. LiuGong products are specifically designed for the American market and deliver modern, ergonomic, durable and well-supported products. Stärke Material Handling Group Stärke Material Handling Group 402 Allanburg Road Thorold, Ontario, Canada L2V 1A4 Toll-Free: 877-435-4352 Fax: 1-905-227-2072 Email: info@starkeforklift.com Web Site: www.starkeforklift.com At Stärke Material Handling Group, our goal is to provide one of the most comprehensive lines of material handling equipment in the industry. From Class II to Class VI, the Stärke brand is capable of meeting even the most challenging applications with our full line of forklifts, pallet trucks, stackers, reach trucks, order pickers and electric utility vehicles. Because it makes sense to expect peace of mind at a fair price! Cavaion Baumann USA P.O. Box 90 Fredericksburg, VA 22404 Toll-Free: 800-548-2839 Phone: 540-898-8636 Fax: 540-898-8143 Web Site: www.designstorage.com For over 40 years the Cavaion Baumann Sideloader has been synonymous with quality & craftsmanship. As the exclusive distributor of Cavaion Baumann sideloaders in North America, CBUSA offers a dedicated team of sideloader experts to tailor any model of the world’s largest and most complete range of long load handling equipment to your specific application. Our nationwide support team is backed by the single largest sideloader replacement parts inventory not just in North America, but anywhere in the world! Design Storage & Handling P.O. Box 90 Fredericksburg, VA 22404 Toll-Free: 800-548-2839 Phone: 540-898-8636 Fax: 540-898-8143 Web Site: www.designstorage.com As the exclusive distributor of Hubtex sideloaders in North America, Design Storage offers a dedicated team of sideloader experts to tailor any model of the world’s largest and most complete range of long load handling equipment to your specific application. Our nationwide support team is backed by the single largest sideloader replacement parts inventory not just in North America, but anywhere in the world! MHconX.com is buy and sell material handling equipment website which is a joint partnership of Material Handling Network and Material Handling Wholesaler. MHconX.com connects you to a marketplace network of dealers throughout the World for new, used and rental equipment under one site. Professional Materials Handling 6932 Hanging Moss Rd. Orlando, FL 32807 Phone: 407-677-0040 Fax: 407-677-5948 Web Site: www.verynarrowaislelifts.com Email: sales@pmh-co.com Member Affiliations: MHEDA Established in 1972, PMH is your very narrow aisle turret truck specialist. We are the North American distributor of STEINBOCK and offer a full line up of new and pre-owned turret trucks manufactured in Germany. For your heavy and long load applications PMH distributes the “original” sideloader manufactured by BP. Our equipment is built to suit customer specific requirements. Dealer inquires and customer direct sales are welcome. Stärke Material Handling Group 402 Allanburg Road Thorold, Ontario, Canada L2V 1A4 Toll-Free: 877-435-4352 Fax: 1-905-227-2072 Email: info@starkeforklift.com Web Site: www.starkeforklift.com At Stärke Material Handling Group, our goal is to provide one of the most comprehensive lines of material handling equipment in the industry. From Class II to Class VI, the Stärke brand is capable of meeting even the most challenging applications with our full line of forklifts, pallet trucks, stackers, reach trucks, order pickers and electric utility vehicles. Forklifts: Telescopic Mike Yacks, V.P. Sales/Marketing Meijer Handling Solutions 131 Franklin Plaza, Unit #335 Franklin, NC 28734 Phone: 828-349-9619 Fax: 877-548-4604 Web Site: www.telescopicforks.com Email:info@meijer-group.com Meijer Handling Solutions has long been known as the pioneer and world market leader of the innovative hydraulic and manual telescopic forks more commonly known as KOOI-REACHFORKS®. Meijer Handling Solutions also offers a complete range of pallet-less handling attachments, (www.slipsheet-attachments.com), which includes ROLLERFORKS®, Rollerized Tine Extenders, Push-Pull attachments, Stationary Pallet Changers, (load transfer stations), and more. Other innovative equipment includes Mast Height Extension Systems, (Vertical Lift Forks), hydraulic telescopic Jib Cranes, Booms, Rollerized Tine Extenders for air cargo and more. Forklifts: Used MHconX.com MHconX.com 801 Bluff St. Dubuque, IA 52001 877 638-6190 Email: dmillius@MHWmag.com or acoffman@mhwmag.com Website: www.MHconX.com MHconX.com is buy and sell material handling equipment website which is a joint partnership of Material Handling Network and Material Handling Wholesaler. MHconX.com connects you to a marketplace network of dealers throughout the World for new, used and rental equipment under one site. Seth Caldwell THE FORKLIFT PRO 9801 Industrial Drive PO Box 99 Pineville, NC 28134 Phone: 704-716-3636 Fax: 704-714-4622 Email: seth@theforkliftpro.com Website: www.theforkliftpro.com Large selection of quality used equipment ~ Cushions / Pneumatics LP / Gas / Diesel / Electrics. Rough Terrains to Narrow Aisle. Call us first. Export Specialists! Always stocking ~ New Side Shifters/Forks/Carpet Poles/ Chargers. Call Seth - THE FORKLIFT PRO always buying & selling! The WORLDWIDE Wholesalers of Quality Lift Trucks! Booth #S3940 April 3-6 TOUGH WORLD. TOUGH EQUIPMENT. LiuGong Forklifts are modern, ergonomic, durable and well supported. LiuGong provides quality products supported by an American style after sales support and distribution model, and features an industry best 3 year / 6,000 hour comprehensive warranty. Based near Houston, Texas, LiuGong North America supports LiuGong Forklift Dealers with onsite training and support, online parts system, electronic warranty system, marketing support and wholesale and retail finance options. Our unmatched value increases profits and reduces risk. Contact LiuGong North America to learn more. ROLLING MEADOWS, IL | JUNE 7, 2017 The Material Handling Huddle is an opportunity for you to build a more profitable business through networking and education. Increase your knowledge of issues, regulations, products and services vital to our industry. Develop and improve relationships with other dealers and manufacturers. Join us at the Holiday Inn-Rolling Meadows, IL. for an educational one-day conference, June 7, with key industry leaders giving you ideas to take back to your business the next day. This four-session format will include topics that are trending in the industry. Take part in networking opportunities before and during the event, plus a vendor mall for ideas on products and services to expand your product line. CEO’s, presidents, sales and parts managers, key management and those aspiring to be promoted to management positions in their company. WHAT CAN YOU GAIN FROM ATTENDING THIS ONE-DAY CONFERENCE? • Learn from industry experts on dealership profitability • Best practices for increasing client bases and products/services key to revenue generation • Networking with your peers to learn what is currently working in their businesses • Learn industry trends to get ahead of your competition • The event‘s compact format allows you to mix with industry leaders and get answers to your business-specific industry questions • Plus, more! THIS ONE-DAY EDUCATION AND NETWORKING EVENT WON‘T BREAK THE BANK! $299 per person—Early bird rate (Good until March 1, 2017) $399 per person after March 1st. Price includes a casual networking opportunity on the evening of June 6th, and a four-session all-day conference with lunch & refreshments on June 7th. We have reserved a block of hotel rooms until March 1st or until rooms are sold out at the special rate of $109 each. Make your reservation at www.MHhuddle.com under Lodging. Capitalizing on the Aftermarket rollercoaster Dave Baiocchi The role of aftermarket sales in the equipment dealership is changing. Join Dave Baiocchi, Wholesaler Aftermarket columnist, as he reviews the history and state of the industry. He’ll discuss changes in salesman training, marketing, value proposition and sales activities within the dealership and the ever-changing needs and desires of your customer base. Financing and leasing Garry Bartecki Garry Bartecki, Wholesaler Bottom Line columnist and his team discuss the current methods and options regarding renting and leasing material handling equipment. Learn how to educate and present renting and leasing options to customers and how the new lease accounting rules will impact both dealers & lessees. Marketing Tools to Grow Your Business Debbie Frakes Debbie from Winsby, Inc. will show you tools, strategies and offers that help manufacturers and distributors grow their revenues. Find out how to increase inbound leads to leverage your sales team’s time. Learn how to increase website visitors and find out what pages they view and when, what works best to trigger interest among prospects, how to build your email list and best email strategies, what will push your company to the top of search engine results, and more. Group Roundtable Final Questions . . . . . . . . . . 2:30—3:30 PM Now’s your chance to get answers from the industry leaders. All of today’s speakers will be available for a roundtable discussion. Large selection of quality used equipment ~ Cushions / Pneumatics LP / Gas / Diesel / Electrics. Rough Terrains to Narrow Aisle. Call us first. Export Specialists! Always stocking New Side Shifters/Forks/Carpet Poles/ Chargers. WORLDWIDE Wholesaler of Quality Lift Trucks! Call Tim - THE FORKLIFT PRO with 36 years forklift experience! The WORLDWIDE Wholesaler of Quality Lift Trucks! Large selection of quality used equipment ~ Cushions / Pneumatics LP / Gas / Diesel / Electrics. Rough Terrains to Narrow Aisle. Call us first. Export Specialists! Always stocking ~ New Side Shifters/Forks/Carpet Poles/ Chargers. Call David – THE FORKLIFT PRO exports specialist! ¡Se habla español! The WORLDWIDE Wholesaler of Quality Lift Trucks! Call Vince - THE FORKLIFT PRO with 20 years forklift experience! The WORLDWIDE Wholesaler of Quality Lift Trucks! Jimmy Flaherty THE FORKLIFT PRO 9801 Industrial Drive PO Box 99 Pineville, NC 28134 Phone: 704-716-3636 Fax: 704-714-4622 Email: jflaherty@theforkliftpro.com Website: www.theforkliftpro.com Large selection of quality used equipment ~ Cushions / Pneumatics LP / Gas / Diesel / Electrics. Rough Terrains to Narrow Aisle. Call us first. Export Specialists! Always stocking New Side Shifters/Forks/Carpet Poles/ Chargers. Call Jimmy - The WORLDWIDE Wholesaler of Quality Lift Trucks! TVH TVH Headquarters 16355 South Lone Elm Road Olathe, KS 66062 USA Phone: 913-829-1000 Toll-Free: 800-255-4109 Fax: 913-829-9208 Email: US.Sales@tvh.com Website: www.tvh.com TVH is the worldwide leading supplier of quality replacement parts and accessories for all your material handling and industrial equipment needs! With over 8 million parts and 11 distribution centers in North America, youâ&#x20AC;&#x2122;ll be able to find the right part in stock and know that itâ&#x20AC;&#x2122;s ready to ship. Our commitment to service, knowledge and product availability has made us a One-Stop-Shop for our customers and their business needs. Rhino Rubber LLC, manufactures and distributes solid and pneumatic industrial tires. Rhino is focused on providing high quality industrial tire products and service to customers around the globe. Rhino Rubber brings over 30 years of experience servicing the material handling and related industries with a commitment to continuous improvement and service excellence. Ergonomic material handling equipment for pallets, skids, drums, reels, rolls, crates and boxes. Pallet Jacks, Skid Lifts, Stackers and Rotators. Specializing in customization and stainless equipment. Quick Ship Inventory from Chicago. Danish quality since 1940. Home of the Thork Lift. Founded in 1907, Hamilton Caster is an industry leader in designing and manufacturing heavy-duty industrial casters, wheels, carts, and trailers. Hamilton specializes in the custom design and manufacturing of large capacity casters ranging from 1,000 lbs. up to 40,000 lbs. and industrial trailers ranging from 2,000 lbs. up to 100,000 lbs. Sharpen your skills with professional, hands-on training from TVHU. We’ve included more classes at more locations to better serve you. Enroll today! Are you a distributor, dealer or OEM selling material handling, supply chain and logistics equipment or services in North America? Connects you to industrial end users that require material handling equipment, products and services. Tri-Boro has been operated by one family since its inception. All our products including shelving, service carts, workbenches, specialty rack and pallet rack are USA made. Tri-Boro is the only company in the USA to offer universally compatible pallet rack and warehouse shelving products from one source. Eric Gonda UNIRAK Storage Systems/ F&F Industries, Inc. 7620 Telegraph Rd. Taylor, MI 48180 Toll Free: 800-348-7225 Phone: 313-291-7600 Fax: 313-291-7605 Email: info@unirak.com Web Site: www.unirak.com Assist your customers in maintaining a safe warehouse environment. Price new frames and beams from UNIRAK Storage Systems. We’re a manufacturer, this assures you of quality product with competitive pricing and a powder coat finish second to none. We have a robust and successful Stock Solutions Quick Ship program if short lead times are imperative. We offer many accessories like wire mesh decks, fork entry bars, drum cradles, back-stop beams, center and side mount reel holders - we have the solutions you need. Pallet Truck – Scales Jesper Jorgensen Interthor Inc. 1817 Beach St. Broadview, IL 60155 Phone: 888-345-1270 Fax: 888-345-2995 Email: sales@interthor.com Web Site: www.interthor.com Member Affiliations: NPES, MHEDA, MHI Ergonomic material handling equipment for pallets, skids, drums, reels, rolls, crates and boxes. Pallet Jacks, Skid Lifts, Stackers and Rotators. Specializing in customization and stainless equipment. Quick Ship Inventory from Chicago. Danish quality since 1940. Home of the Thork Lift. We’ll help you move big, heavy loads quickly and efficiently. Specialists in solving mobility problems, Nutting can adapt an existing design or custom engineer and build for any material handling application. Call us with your requirements and see what we can do. Established in 1971 – Service and Parts for ALL brands, New, Used, Rental, Leasing - related material handling equipment. Expert Nationwide Parts Service. Forklift Professionals. Rack Decking: New David Swanson DACS, Inc. 900 Port Centre Parkway Portsmouth, VA 23704 Toll-Free: 800-909-4937 Cell: 757-817-7335 Fax: 800-909-4938 Email: dswanson@dacsinc.com Web Site: www.dacsinc.com Member Affiliations: MHI, SDI, PRISM DACS, Inc., founded in 1987, specializes in the manufacture of corrugated steel decking products for material handling and commercial construction: rack deck, Punch Deck®, Fluekeeper®, fire baffles, mezzanine deck, floor deck and roof deck. DACS offers engineering services and detailed drawings for every application, and accessories for installation of our products. Racks: Used UNIRAK Storage Systems/ F&F Industries, Inc. 7620 Telegraph Rd. Taylor, MI 48180 Toll Free: 800-348-7225 Phone: 313-291-7600 Fax: 313-291-7605 Email: info@unirak.com Web Site: www.unirak.com Assist your customers in maintaining a safe warehouse environment. Price new frames and beams from UNIRAK Storage Systems. We’re a manufacturer, this assures you of quality product with competitive pricing and a powder coat finish second to none. We have a robust and successful Stock Solutions Quick Ship program if short lead times are imperative. We offer many accessories like wire mesh decks, fork entry bars, drum cradles, back-stop beams, center and side mount reel holders - we have the solutions you need. Before making your next tire selection, visit our new website to see our entire line of tires and the benefits they offer or call us today. Take the PAIN out of your supply chain. Move it exclusively…MOVE IT ON RHINO. Easy to Find...Tough to Beat. Steer Axles: Remanufactured American Industrial Transmission Phone: 800-588-7515 Web Site: www.aittransmission.com AIT has been rebuilding transmissions for over 35 years. Our shop equipment includes a number of machines and their tooling for a variety of processes. Our tools include presses and cleaning tanks. We realized that we have all of the necessary facilities to produce remanufactured steer axles in-house. The only exception is the chrome plating needed for some cylinders. That is subcontracted locally. Cores have been purchased and exchanges for popular styles are on the shelf. Our prices are competitive. Our quality is what you expect from American Industrial Transmission. Rhino Rubber LLC 275-299 N. Arlington Rd., Unit A Akron, OH 44306 Toll Free: 877-Rhino-03 Fax: 888-480-8611 Web Site: www.rhinorubber.net Rhino Rubber LLC, manufactures and distributes solid and pneumatic industrial tires. Rhino is focused on providing high quality industrial tire products and service to customers around the globe. Rhino Rubber brings over 30 years of experience servicing the material handling and related industries with a commitment to continuous improvement and service excellence. The most efficient, permanent, and economical solution to solve your exact storage needs! The Advance Metalworking Co., Inc. manufactures both hydraulic elevating platform and inclining platform trailers. The Lift-a-Load Elevating Platform Trailer can be hydraulically lowered to ground height or raised to dock height or any level in between while remaining level throughout the procedure. Models available with straight tongue or gooseneck hitch, single or dual axle with capacities from 4,400 to 15,000 lbs. The Lo Riser Inclining Platform Trailer can be hydraulically lowered to ground height. The built-in ramp provides a minimum 4-degree angle allowing easy, drive-on access. Models available with GVWR of 8,500, 13,500, 15,500, 17,650 and 19,725 lbs. Interthor Inc. 1817 Beach St. Broadview, IL 60155 Phone: 888-345-1270 Fax: 888-345-2995 Email: sales@interthor.com Web Site: www.interthor.com Member Affiliations: NPES, MHEDA, MHI Ergonomic material handling equipment for pallets, skids, drums, reels, rolls, crates and boxes. Pallet Jacks, Skid Lifts, Stackers and Rotators. Specializing in customization and stainless equipment. Quick Ship Inventory from Chicago. Danish quality since 1940. Home of the Thork Lift. Wire Rack Decking Hannibal Industries, Inc. 6501 Bingle Rd. Houston Texas 77092 323 588-4261 gsteen@e-hii.com www.hannibalindustries.com Providing Value Beyond Expectations Hannibal Industries is a pallet rack manufacturer with a diverse product line that enables the company to offer material handling products to the most massive operations in the world. Hannibal Industries, Inc. 3851 S. Santa Fe Avenue Los Angeles, CA 90058 323 588-4261 gsteen@e-hii.com www.hannibalindustries.com Providing Value Beyond Expectations Hannibal Industries is a pallet rack manufacturer with a diverse product line that enables the company to offer material handling products to the most massive operations in the world. It Freight Forwarding, Custom Broker & Logistics Provider. to buy and sell equipment MHconX.com is the industryâ&#x20AC;&#x2122;s newest website for buying and selling equipment nationwide that is a joint partnership of two of the industryâ&#x20AC;&#x2122;s most respected publications, Material Handling Network and Material Handling Wholesaler. New equipment added daily! Call 877.638.6190 for more details and see how MHconX.com is a better way to buy and sell equipment. to buy & sell equipment! Still the one for advertising RESULTS! system rigidity AND long term flexibility for product mix elevation changes. provides consistent robotic end plate weldable shapes and precision length cuts. welded of 55 KSI hi-strength steel. (4 rivet available and standard on 6.5” SB650) and replaceable locking clips. Floor to top of first level, or greatest vertical span. Above components meet or exceed current AISI & RMI capacity & deflection specifications. Contact factory for first level beam spacing greater than 96 inches. Recommended for high traffic areas, at minimum 60” high. Impact protection and capacity gains. HD splice kits feature outer wrap and inner splice matched pattern mounting plates. Common in seismic areas and where tall height to depth ratios require additional anchoring. Available in bolt-on or welded in 4” to 60“ height2.5”x2.5”x1/4 “ structural angle. Per RMI guidelines, rack frames must be plumb to achieve specified capacity. Anti-spin, 1/8th thick. 1. Capacities are shown per pair of beams for Uniform Distributed Loads (meeting RMI 2012 cap guidelines). 2. Beams over 114” should be tied across middle to prevent lateral beam spread/rotation- contact dealer for info. 3. Beams over 90” that support non-waterfall/ flanged or tek screwed decking should be tied together (Consider UA206 crossbars). 4. Full loads per above chart reflect lesser of bending vs. L/180 deflection criteria. All SB650 beams feature 8” endplates but also used for HD applications, some seismic, and single beam level installs. Commonly used in gravity pallet & carton flow to provide conveyor support where slopes vary. Standard clips are factory installed and powder coated. Replacements are ZINC coated and in stock- Grav. Pins. Manufactured to spec-from HD tube/structural channel beams to light duty hand stack small profile box beams. Operators should be aware of safe load capacity limits Labels are available or spec for in house production. Standard duty 201/ 203 series row and wall ties are 14 GA galvanized. 202/ 204 HD are tubular powder coated. Both inc. frame hardware only. When hi-quality rack-able pallets are used, UA206 Cross Bars offer added safety for misplaced or skewed pallets. Store/ dispense spooled product. Accepts upto 1.75 inch diameter axles. Sold in pairs. Sheet stock, or any product non-palletized product, can be stored and supported on 3.5” tubular supports. Recommended for high traffic areas, at minimum aisle entry points. 1/4” thick steel, multi height with 4 anchor holes. UA222 Back Stop Beam Assemblies come in 3 pc kits. 1.5” square tube bolts to 12 GA Bkts. Offsets to spec. Similar to UA217 post protectors, one leg is long and allows 1/4” thick steel to run depth of upright for protection. We stock Made in USA Wire Mesh Deck. 42”/48” deep decks feature cut channel style while 24”/36”=flared. In applications where heavy point loading is expected, we manufacture 12 GA solid deck with tubular supports. Full steel mesh wire rack back or netting combined with UA222 Pallet Back Stops (net) protect adjacent traffic areas. Hi-Gloss, Durable Powder Coat Finish Our high strength steel racking components start with a multi-stage phosphate bath prior to electrostatic coating then baking. The result is an abrasion resistant finish second to none. Pick high contrast colors to complement your operation. Have large DC’s with 1000’s of Selective Pallet Rack Positions? From concept drawings to timely shipment and professional installation, Unirak provides 100% Customer Satisfaction. Need a rack solution quick? We have 100’s of frames and 1,000’s of beams, deck and accessories in stock. Ask your dealer about the UNIRAK Stock Solutions Quick Ship program. We plan vacant production slots - even custom, made to order solutions can often hit your tight deadline. Or need custom designed Unirak selective rack on a space saving movable aisle rack system? Red, yellow, 100’s of RAL colors and custom color matching is available and quoted to spec. Galvanized Hot Dip Zinc Coating Meets ASTM A 123-12 For high humidity, outdoor or abusive environments, your rack can be Hot Dip Galvanized. UNIRAK is your Professional Grade, Universal rack solution. Ask your professional Material Handling Equipment Dealers for local references.